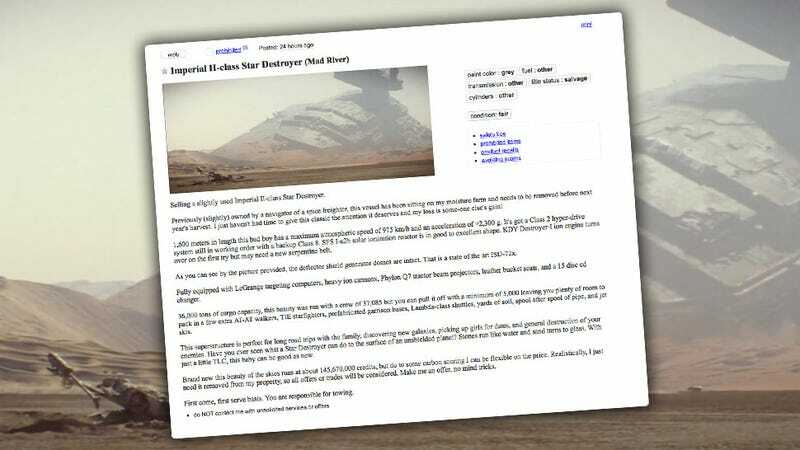 Ever since the most recent Star Wars trailer came out, with its prominent, crashed Imperial Star Destroyer half-buried in the sand on some miserable outer-rim planet, rubber hoses and gaskets getting all dry-rotted, clever people have been trying to sell it on Craigslist. There’s actually been a few ads — let’s look at one. Let&apos;s Break Down The Secrets And Spectacle Of The New Star Wars Trailer! That’s pretty good. Whoever comes to get it should probably bring a few million car batteries and some jumper cables to get it going again, though. It looks like it’s been sitting there for a while. And, be ready to clean out a lot of bantha poop.